The Harlem Globetrotters are getting ready to suit up for their 2015 “Washington Generals’ Revenge” Tour, which will bring their world-famous family show to the Bernard G. Johnson Coliseum at Sam Houston State University on Jan. 21. The game will highlight the Washington Generals rivalry as the Generals attempt victory over the Globetrotters for the first time in almost 50 years. Five years have passed since the last time the two teams met on the court, and the Generals are determined to bring home a victory this time around. The show will also feature incredible ball handling, trick shots, astonishing dunks and more fan interaction than any other family show. The Globetrotters, internationally known as Goodwill Ambassadors, are making an effort to show appreciation to those who serve and protect our freedom by honoring a Harlem Globetrotters Hometown Hero at each game of the tour. Fans can nominate active, wounded or retired military members who display admirable character and are active in the community at harlemglobetrotters.com. An all-star lineup including Big Easy Lofton, Ant Atkinson, Hi-Lite Bruton, Thunder Law, Bull Bullard, Firefly Fisher and Moose Weekes—along with female stars TNT Maddox, T-Time Brawner and Sweet J Ekworomadu—will make this an event unforgettable for families. Fans may also purchase a Magic Pass, which will gain them entrance to a pre-show event, where they will be able to hit the court alongside the Globetrotters, shooting, trying out ball tricks and photo opportunities. 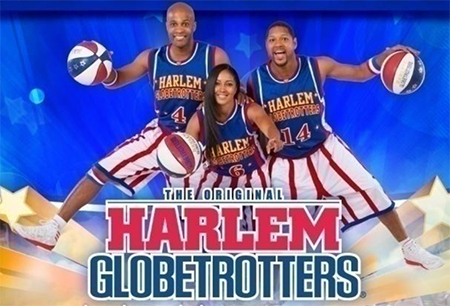 Tickets start at $23 and are now available at harlemglobetrotters.com, the Johnson Coliseum Box Office, ticketweb.com, or by phone at 936.294.3021. Discounted tickets are available for purchase by SHSU students, faculty and staff. The SHSU School of Music is ringing in the New Year with a recital given by piano instructor Anna Petrova and visiting artist Delyana Lazarova on Friday (Jan. 16) at 7:30 p.m. in the Gaertner Performing Arts Center Recital Hall. The duo will perform classical music from the baroque and romantic periods. Lazarova will open with a solo violin piece by Johan Sebastian Bach, who, according to Petrova, is considered one of the most enigmatic and ingenious classical composers by many musicians. The next piece will be the “Second Sonata for Violin and Piano” by Edvard Grieg, a Norwegian romantic composer known for blending his music with traditional folk tunes and rhythms. “His sonata for violin and piano is one of the pillars of the violin and piano repertoire and, in general, one of the most beautiful and moving great works in the literature,” said Petrova. “It bears the features of heightened romanticism with intense, chromatic harmonies and lush melodies. Petrova and Lazarova will close out the recital with a piece by Belgian composer Cesar Frank. The two have been performing together since they were children growing up in Bulgaria. 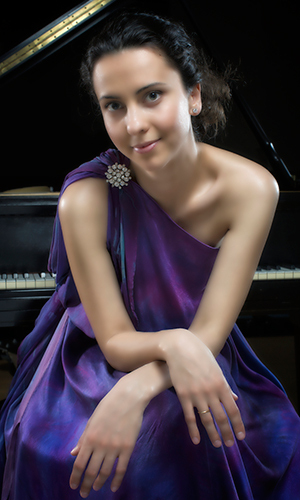 Petrova holds Bachelor of Music and Master of Music degrees from New York’s Manhattan School of Music. Lazarova holds Bachelor of Music and Master of Music degrees, as well as a performance diploma in violin from Jacobs School of Music at Indiana University. In August 2014, Lazarova joined the faculty of Alabama State University as an adjunct violin professor. “We hold prizes from different compositions and festivals from Europe. Now we both live in the U.S. after completing our performance degrees, and we enjoy continuing to play concerts together,” Petrova said. The Sam Houston State University Professional and Academic Center for Excellence is gearing up to launch its second Project-Based Learning workshop. This year’s workshop will consist of three sessions—on Feb. 13, March 4 and April 1. PACE will host an informational meeting about the second round of classes on Friday (Jan. 23), from 11:30 a.m. to 3 p.m. in Lowman Student Center Room 320. Anyone in an instructor role who is interested in PBL is encouraged to attend the meeting. Project-based learning encourages students to actively explore real-world problems and challenges them to develop a deeper knowledge of course material. The first workshop, which was held in fall 2013, had 27 faculty members participate in the four-session training. Jill Ackers-Clayton, who has experience training K-12 teachers in PBL, conducted the workshop. The faculty involved in last year’s workshop created projects that helped them to implement this approach into their classrooms. Some of the project titles include “Business and Finance using PBL,” “Thermodynamics Lab” and “Using Multimedia to Facilitate Course Development.” These faculty members have since seen the positive effects of PBL in their students. “Students are motivated in a more focused way since they are charged with the task of solving a problem, one that they themselves will face in their personal engagement with course content,” said Sheryl Murphy-Manley, professor of musicology. “After attending the PBL sessions, I have become comfortable with the structure of a project-based learning experience. I have also become more confident that I could implement a functional and industrially relevant teamwork experience for my students,” said Darren Williams, associate professor of physical chemistry. For more information, contact PACE at 936.294.2688 or PACE@shsu.edu. 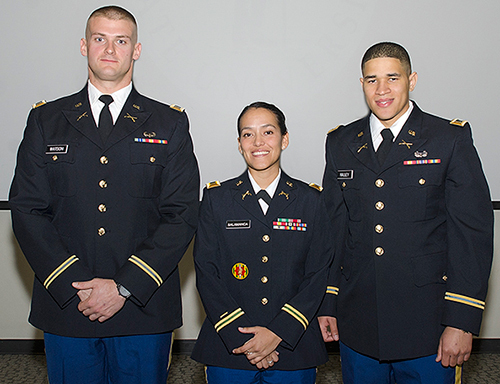 Three Sam Houston State University seniors were commissioned as second lieutenant in the U.S Army during a December ceremony in the Lowman Student Center Theater. They include Stephen Nalley, Adriana Salamanca and Travis Watson. Nalley, a Garland native, enlisted in the Texas Army National Guard in 2009. In 2011, he enrolled at SHSU and joined theBearkat Battalion, where he has since served in a number of leadership positions. He graduated in December with a Bachelor of Science degree in criminal justice and a minor in military science. He received an active duty commission as an infantry officer. Salamanca, from Damascus, Maryland, enlisted in the Texas Army National Guard in 2006. She enrolled at SHSU in 2012 and joined the Bearkat Battalion in 2013, where she went on to hold many leadership positions. She graduated with a Bachelor of Arts degree in Spanish, with minors in secondary education and military science. She received an active duty commission as a military police officer and will report to her first duty station in Fort Leonard Wood, Missouri. Watson, a Norman, Oklahoma native, first graduated from SHSU in 2012 with a Bachelor of Arts degree in political science and minors in history and Middle Eastern studies. After enlisting in the Texas Army National Guard in 2012, he later joined the Bearkat Battalion. He is a Distinguished Military Graduate and received his Master of Science degree in homeland security. Watson has received an active duty commission as an infantry officer. More than 300 people attended the inaugural Mental Health Conference offered by theCorrectional Management Institute of Texas at Sam Houston State University, where counties and professionals presented and discussed best practices in serving the mental health needs of offenders in the various components of our criminal justice system. The four-day conference offered sessions on assessing offenders for suicide, medical and mental health issues; implementing effective mental health services in jails; understanding criminal and civil competency issues in courts; addressing the needs of veterans and other special populations with substance abuse or medical issues; establishing mobile crisis intervention services; focusing on medication issues; exploring legislative mandates; and collaborating with other agencies. It also featured initiatives implemented in many counties in the state, as well as professionals in the field. Among those who shared programs they have implemented to address the needs of offenders with mental health issues were Rockwall County, the University Health System in San Antonio, Montgomery County, the Travis and Lubbock County Sheriff’s Offices, MHMR of Tarrant County, the Harris County Office of Mental Health and Medical Security Unit, Bell County’s Community Supervision and Corrections Department, the Brazos County Mental Health Unit, and The Burke Center. “Having the opportunity to hear what other mental health centers are doing and the way they collaborate with the various community agencies in their area was the most beneficial,” said a participant. One of the key messages from the conference was the need to work collaboratively with partners in the community. 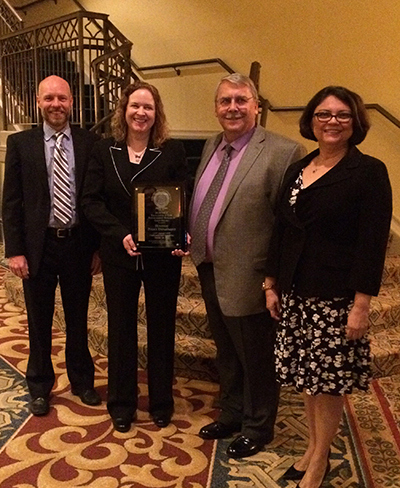 The Houston Police Department took home the Gold Award in Research from the International Association of Chiefs of Police for an experiment conducted in collaboration with Sam Houston State University on eyewitness identification procedures. “The Houston Police Department Eyewitness Identification Experiment: Analysis and Results” tested four different methods of presenting photo spreads to robbery eyewitnesses to determine if the methods produced different patterns of eyewitness selection results. “The Houston Police Department has had a long standing relationship with Sam Houston State University,” said Martha I. Montalvo, executive assistant chief at the Houston Police Department. 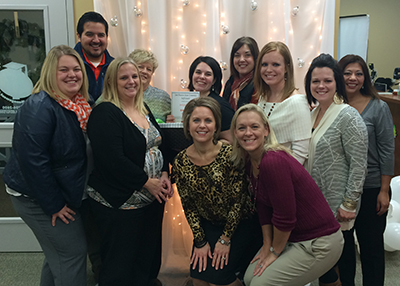 “SHSU has long been our partner in identifying best practices. The goal in this study was to ascertain which eyewitness identification method was more reliable. The findings from this experiment contribute to an ongoing discussion in the criminal justice community about the best ways to conduct eyewitness identification procedures. The Houston Police Department results were based on an analysis of surveys from more than 700 photo-spread procedures conducted in 2013. The experiment looked at four variations of eyewitness identification procedures, including sequential and simultaneous presentations, and blind and blinded procedures. In the sequential presentation, the eyewitness viewed photos one at a time, while in a simultaneous presentation, all photos are viewed at the same time. The Gold Award for Excellence in Law Enforcement Research is presented by the International Association of Chiefs of Police to agencies that demonstrate excellence in conducting and using research to improve police operations and public safety. The goal of the award is to establish effective research and promote partnerships with researchers. The IACP is the oldest and largest non-profit member organization of police executives, with more than 16,000 in 94 countries. 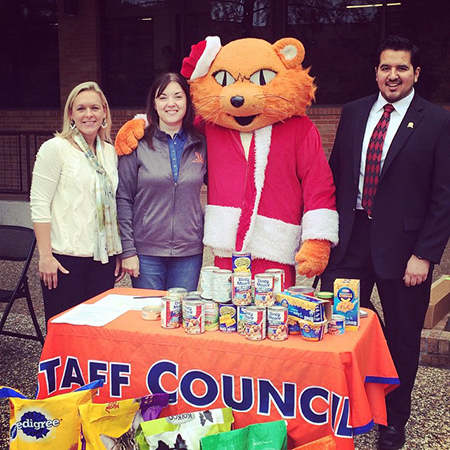 The Sam Houston State University Staff Council rang in the holiday season by hosting its fifth annual People and Pets Food Drive, collecting more than 460 pounds of food for the Good Shepard Mission, Rita B. Huff Animal Shelter and the SHSU Food Pantry. Each year, departments are encouraged to come together to support the community with some friendly competition. This year, the art department was responsible for donating the largest amount of food items and was treated to a special breakfast. More than 20 members from the Staff Council came out to volunteer their time, and a few furry friends even came out to show their support for the event, according to Melissa Asbury, who was in charge of the event. If you missed this year’s event, but would still like to contribute, donations are accepted year-round at all three organizations. For more information on the Good Shepard Mission and Rita B. Huff Animal Shelter, visit their websites at thegsmission.org or ritabhuff.org. To learn more about the SHSU Food Pantry, contact Candice Hanner at 936.294.2231. Filson, who is known for her positive attitude, has worked for SHSU for three years and currently coordinates the Leadercast program. Filson is actively involved with her church, and she and her husband Andrew volunteer with Journey Through Bethlehem every year. She also enjoys watching her daughters Anabelle, 7, and Grace, 5, dance at Studio C, a local dance studio. When she finds time to relax, Filson loves to read and said that her favorite genre of movies to watch is musicals. Information collected for the Today@Sam calendar pages, atshsu.edu/~pin_www/calendars, is used by various media outlets, as well as the Communications Office for news stories and releases. To see a full list of the Today@Sam submission guidelines, or to access submission forms for news or feature stories, calendar submissions, or hometown releases, visitshsu.edu/~pin_www/guidelines.html.